What a difference the heat of late spring and early summer has on my jungle. I like a changing garden. 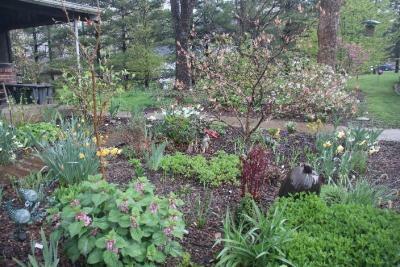 Gone are all remnants of spring flowering plants; replaced with summer blooms, the likes of shasta daisy, bottlebrush buckeye, monarda, skullcap, oakleaf hydrangea and daylily. Everything has filled in and the entire garden has taken on the feel of secret, enclosed spaces. Gardens like my jungle are a lot of work though. 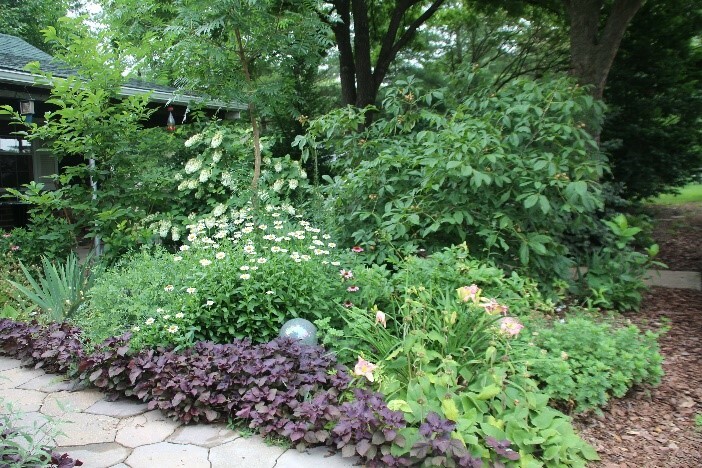 Unwanted volunteer plants like pokeweed, bush honeysuckle, and redbuds can easily become establish unnoticed. I just cut down a 5-foot tall black walnut trying to escape notice by growing in another plant. It is a constant vigil to keep and/or maintain spreading plants you want while rogueing out those you don't. A recent scouting of beds ended in a happy dance that I hope none of the neighbors witnessed. 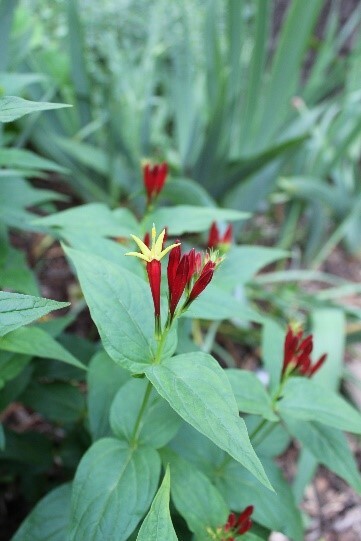 But really, what is more exciting than spotting a volunteer Indian pink (Spigelia)? Indian pinks are one of my favorite US natives, but I have always found it difficult to get new plants to take. Suffice it to say, Indian pinks are a welcomed spreader in my jungle. Pretty soon it will be time to start dividing iris. Late summer through early fall is the best time to divide and replant bearded iris. This timing allows iris the four to six weeks needed following flowering for new rhizomes to fully develop before digging and dividing. Once the clump is dug, the individual new rhizomes can be cut away from the mother rhizome with pruning shears or a knife, then replanted. The spent mother rhizome can be disposed of in the compost pile. I usually tag iris that I plan to remove in the spring at flowering so I have a positive identification. Otherwise it becomes difficult to identify one set of rhizomes from another with just leaves present, especially if several cultivars have grown into each other. What I didn't plan for was our new golden retriever puppy, Sophia. Removal of those little ribbons tied to plants seems to be the best game in town. I was asked recently if it was too late to plant onions in the garden. Although onions can be one of the earliest planted vegetables, early planting is needed only if the goal is the formation of large bulbs by late summer. If the goal is to produce green onions, then onions can be succession-planted throughout much of the growing season because a lot less growing time is needed if no bulb is being formed. Onions grown for bulbs need enough time to grow leaves (modified leaves that form "rings" in the bulb) before longer daylengths trigger the plant's bulbing phase (ring swelling with storage reserves). Onion cultivars are categorized by how many hours of daylength trigger the bulbing process: long-day (14 hours), intermediate (12 hours) and short-day (10–11 hours). 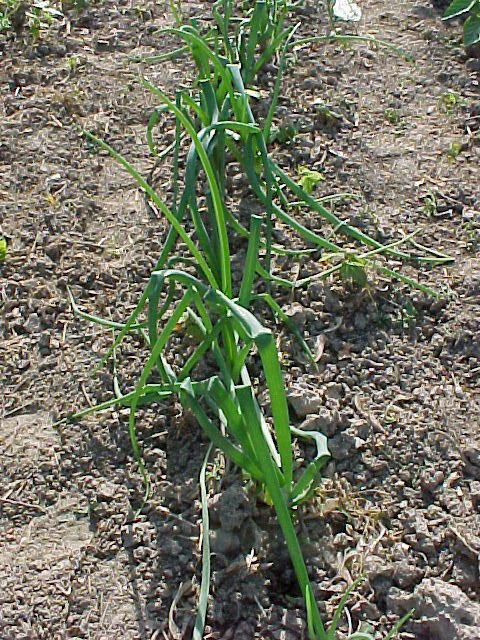 In the northern half of Illinois, gardeners whose goal is large bulb onions should grow only l ong-day onion cultivars; gardeners with that goal in the southern half of Illinois can grow either intermediate- or long-day cultivars. A short-day cultivar never has enough time in Illinois to grow leaves before forming bulbs unless started very early as transplants and that is why they are usually planted only for greens in Illinois. This late in the season though, daylength is long enough to trigger bulbing in all types of onions, so long story short, yes it is too late to plant for big onions but not for greens.